Of the fourteen hundred 300SL coupes produced, only twenty-nine were built in the alloy body configuration. Created for the more sporting oriented driver, the all-aluminum body weighed significantly less than its siblings did. All of the windows, with the exception of the safety windshield, were made from plexiglas. This lighter body weight, in combination with slightly shorter competition springs and stiffer shock absorbers, allowed the car to have a lower center of gravity and roll center. Additional features included a sport camshaft, and knock-off wheels. According to factory records, the first owner of this coupe was Southern California sports car racer Tony Parravano. During the restoration research, we located a US customs receipt written to Parravano for duties paid on the equivalent of $14,000 worth of goods, the cost of a 300SL coupe. It is dated 11/30/56, over a year after the factory records say it was shipped. The cargo is noted as being on the SS Excambion, a ship routinely departing from Europe at that time. Additionally, there is correspondence dated 10/3/56 to Mr. Parravano at the Palace Hotel in Rome from Carlo Saporiti, the Mercedes-Benz agent in Milan, Italy, which consists of 300SL engine tuning specifications. Ironically, this is the same dealer who handled the sale of the 'Count Trossi' SSK, another of the Mercedes-Benz automobiles in the current owner's extensive collection. We purchased this 300SL from Don Ricardo, one of the first NBC Orchestra leaders and a noted car collector, who held the Bonneville Salt Flats class record with his other alloy gullwing. To meet our client's request for an authentic restoration, we needed to locate a sample of the original green-plaid seat fabric. 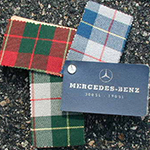 The Mercedes-Benz dealer's sample book of 300SL coupe interiors contains swatches of thirteen standard leather or vinyl colors, along with three different cloth seat options. The cars were ultimately delivered in forty-four different colors. After locating a small original sample of the cloth, we then searched out a hand weaver who could produce the required yardage. Similar research made it possible to accomplish the custom dyeing of the green leather hydes. When we delivered this coupe to the owner, we did not feel that our job was entirely completed. The car had arrived at our shop with an incorrect grille star assembly, but the correct version for this car is now extremely hard to find. A few years passed before we were able to gather all the parts needed to assemble the coveted concave-style grille barrel, and complete the car as delivered by the factory some forty years earlier. This is a subtle detail that may be hard for the uninitiated to appreciate, but one that adds to the value of such a unique vehicle.